I’m eagerly anticipating the day when I can describe completing my to do list as “getting my affairs in order.” You see, I’m reserving that kind of self-importance for the days when my “affairs” consist of more than binge watching Mad Men, sitting atop my counter while I lick a bowl of brownie batter (before it’s empty, mind you), and changing from one pair of pajamas to the next. It should be noted that the second pair of pajamas were quite the trade up. On that day, in the somewhat near future, I’ll turn to Oprah and regretfully tell her that after lunch I simply cannot accompany her to her school in South Africa because “I’ve got to get my affairs in order.” Beg as she will, I simply can’t. There are affairs. And I’ve got to get them in order. Without getting too wrapped up in the details, I think I can safely say that my to-d0’s will involve a chocolate factory, high tea, crumpets, and a petty cash account. Give or take two butlers, a chauffeur, and kindly housekeeper who can help me forget about the cleaning I did today. If you’re anything like me, but let’s both hope you’re not, you can’t really concentrate when your home is in shambles. For me, even if I need to write ten blog posts, sign up for health insurance, and call Publisher’s Clearing House to claim that enormous check, I’ve simply got to sweep my floors first. Tackling the dust is an absolute must. My strategy: Creating small piles along the way so that I don’t have to drag the same clumps of dirt and hair all around my apartment. Three quarters of the way through my dust piling, I might realize that the whole experience would be enhanced if Pandora were streaming a steady beat of 80’s music. I also realize that there are brownies that could, and more importantly should, be eaten. Pause for proper snacking. And before I know what’s happened, I’m dancing to “Jessie’s Girl” with a brownie in each hand. Those carefully mounded dust piles? Check my socks. I move on to task number two. Calling up my landlord to ask them who (the hell!) designed the kitchen that’s equipped with approximately 89 stainless steel appliances, and could they please send that individual to my home to clean the fingerprints off of every square inch of surface area. Because by the looks of it, you’d guess that for the last two weeks, I’ve been doing nothing but rubbing my hands with olive oil and ketchup and then proceeding to grab each and every handle, lever, and knob. Twice. That kind of effort only breeds intense madness. A process that ends with me cleaning so furiously that I end up scouring my own sink. No one ever tells you to clean the kitchen sink. Clean it. Then it’s on to windows, mirrors, glass, bathroom, sheet changing, and laundry. After all is said and eaten…I mean done, it’s time to dine. Something quite satisfying is in order. A burger? I’ll do you one better: a salmon burger. Fresh wild Alaskan salmon chopped and mixed with soy sauce, lemon juice, grated ginger, garlic, parsley, sesame seeds, and panko bread crumbs- seared and topped with a creamy yogurt-dill sauce. Fresh, bright, and wildly flavorful, each bite filled with moist, flaky salmon and the crispy crunch of sesame seeds. I found myself complimenting my burger quite a bit at the dinner table. Giving it bedroom eyes more often than I should admit. Next time you're in the mood for a burger, try these super flavorful salmon burgers with fresh dill sauce! In a small bowl, stir together the Greek yogurt, dill, the remaining half of the minced garlic, and remaining 1 tablespoon of lemon juice. Cover and refrigerate until ready to serve. Finely chop the salmon. In a large bowl, combine the salmon, parsley, panko, ginger, half of the minced garlic, 1 tablespoon of the lemon juice, soy sauce, sesame seeds, salt, and pepper, and mix well. Form into two patties. In a large nonstick skillet, heat the olive oil over medium-high heat. Add the salmon burgers and cook until pink and opaque throughout, 3 to 4 minutes per side. Top each burger with 2 tablespoon of dill sauce and serve. YUM! I have never made salmon burgers before and these look absolutely deish!! Haha, my mom used to clean houses, (she’s the biggest neat freak) and she hated it when a client of hers had all stainless steel appliances. She said she would spend so much time trying to get prints off of it…And I love Salmon, but never tried it as a burger. It looks so good! I absolutely love salmon burgers, but have never made them myself. Yours look way better than the frozen ones I buy at Trader Joe’s! I’ve never had a salmon burger, but yours look delicious! Whew that’s a lot of cleaning! It looks gorgeous though. I love when I get that energy to clean. Stainless steel is a pain in the arse, but it sure looks sharp! Aaahhhh Pippi!! I can’t even thank you enough for reminding me of her! Those salmon burgers looks wonderful!!! I love that kitchen! 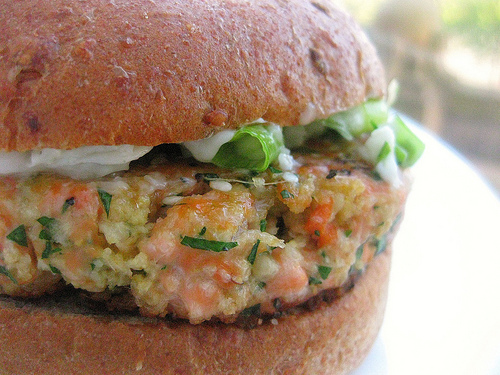 And those salmon burgers look awesome! Those salmon burgers look amazing. Good thing it’s almost dinner time. My kiddies are teaching The OCD in me not to freak out when I see a handprint (or even footprint) on my stainless steel appliances. we are the same way, hubs is worse. gettng our “affairs in order’ round these parts also includes playing JJ games at the same time, or holding him while dust mopping, or trying to pretend you are “looking for him” while we are vacuuming…and so on. somehow, I think, it’s why I am so freaking exhausted come Monday. we too have stainless everything. and it’s my husband that thinks he lives with Monkeys. well, he DOES…doi! These look delicious! And I’m obsessed with Mad Men. Sometimes I just want to put on my apron, curl my hair, and drink a glass of scotch. Except then I would probably pass out from the scotch and ruin my finger curl. Oh well. This is lovely all the same. Ooooh, these salmon burgers sound so good. I like the ingredient combination especially adding the ginger and toasted sesame seeds. But I must confess, I may try them on the grill rather than mess up my stainless cooktop. You had me rolling, finally someone else who see’s the obnoxious chore involved with cleaning these appliances too. Oh everyone likes them, blah blah, until they have to clean them. Any client I have who wants them gets a dissertation on the fun of trying to achieve spotless appliances before they proceed. No amount of searching the internet has left me with a foolproof way of keeping them clean and cooking too. Thanks for the post, someone who cooks and gets it. I love it. Thanks so much, Lisa! I try to be honest here- you’re right- the stainless looks chic, classy, and modern, but the reality is that it’s a pain. And I feel neurosis coming on every time I look around my kitchen! 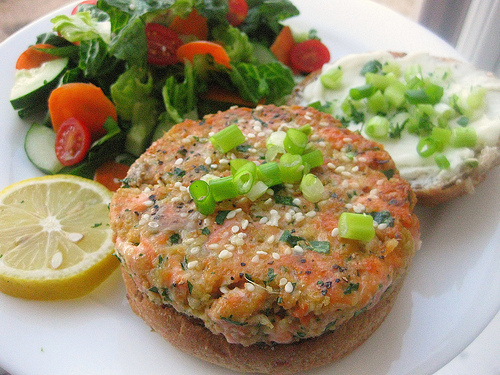 Your salmon burgers look great! Just confused with the ingredients. Could you clean up that part a bit? Can’t wait to try! I am definitely making these for my girl’s night dinner party! I just bought a salmon filet and wasn’t too excited to have it as a fillet. This is perfection, you somehow know my love for Greek yogurt and its healthiness! I am so excited, everyone is going to love this. I think I may try them as sliders! Thank you for this! I love snooping on here, there’s just so many things for me to click on here that interests me! These salmon burgers look great! Have you tried FlyLady.net for cleaning tips? She is so much more than that but she has the best microfiber cloths ever. You are such an inspiration and dang funny too! I am now the heaviest I’ve ever been, 85lb to lose. I have struggled with weight all my life & I’m 54. Thanks for showing me how to take the struggle out of it and just live one healthy day at a time. It’s not new but I need to hear it over & over. Keep it up girlfriend! Hey Rachel! You could sub canned salmon, but the flavor won’t be quite as delicious. Still tasty, though! I just made this burger and ate it and it was INCREDIBLE! My husband does not like salmon but LOVED your recipe. Thank you so very much for sharing. When I was in college, my roommate would cook Costco salmon burgers on the good ol’ George Forman grill! The fishy gross smell would permeate throughout the entire apartment for days! Needless to say, salmon burgers have not sounded appetizing in a long time. When I stumbled upon your recipe however I had to try them. They were a huge hit. My husband and 13 month old son both LOVED them. I now make a big batch of burgers, wrap them in saran wrap and freeze them for an easy dinner. Thank you for this wonderful recipe! PS…they are also great when topped with thinly sliced cucumbers marinated in rice vinegar! Hi there, these look great! Quick question.. How many calories per pattie? I don’t see it posted anywhere?! I need to know calories and fat also! Please! Do you have the calories and fat info on the salmon burger? I want to make this , but I cant unless I can log what I eat. Thank you so much! Great recipe. Could do without all the scrolling to get to it though. These look great. I shy away from making anything with salmon because I don’t know how to buy it. Does this recipe use fresh, frozen or something else? How do you purchase a good tasting piece of fresh salmon? 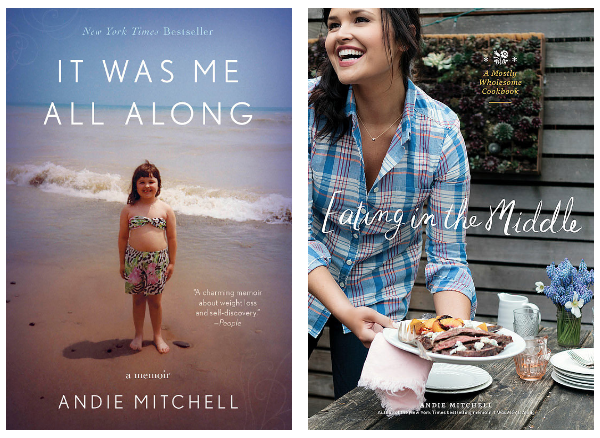 By the way, I just finished your book “It was me all along” & I think you are a very talented writer & am so glad you accomplished your goal! WHAT kind of bun did you use? Ahh I wish I could recall WHAT exactly they were–I made these when I was living in Seattle and I believe I got them from the bakery at Metropolitan Market! They’re so nice and seedy aren’t they? I love whole grain buns like that!